The agent upgrade somehow failed. How can I restart a new agent? My Agent stays in DOWN state. How can I find the root cause? Load Generator: start / stop / remove JMeter containers to run your load tests. Free Memory The server memory information (total and available for load tests). For best efficiency, always use the same hardware configuration for all your agents. Software: Docker must be installed. Docker 17.09CE or newer is recommended. RHEL distributions are not supported by Docker. Prefer Ubuntu or CentOS. You may also use at least quad-cores processor machines, with 10GB free hard-disk space. 70% of the machine memory dedicated to the load tests. Bare-metal Linux machines are strongly recommended for running the load tests. You can use multiple machines to simulate higher loads. We suggest to use no more than 70% of available RAM to prevent any performance issue. Some memory must be left for the operating system and filesystem cache. We recommend to use small (8Go) to medium (16Go) sized machines instead of big ones as JMeter may not behave correctly with very high memory allocation. Follow the instructions related to the OS. Host installation on Windows requires Vagrant, a free and open-source software for creating and configuring virtual development environments. It can be considered a wrapper around virtualization software like VirtualBox. 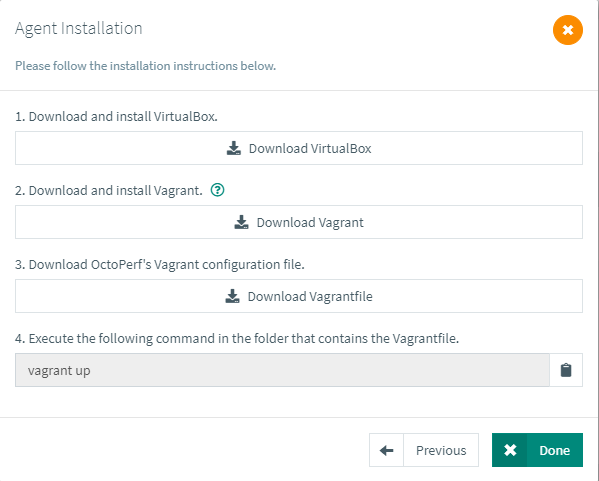 Execute the command vagrant up in the folder that contains the downloaded Vagrantfile. The Host should appear in the list in a couple of minutes. Host installation on Linux requires Docker. So the first command line installs it - you can skip it if you already have docker on your Linux injector. The second command line installs the on-premise agent. Execute the command on the target computer. The Agent should appear in the list in a couple of minutes. The agent can be configured using environement variables. You can specify an environement variable within the agent docker command using --env or -e parameter. See Docker Run for more information. octoperf.auto-update: optional. Default to true. Whenever the agent should upgrade itself when a new version is available. /var/run/docker.sock:/var/run/docker.sock: optional. Gives access to the docker service on the host machine. It's used to start / stop JMeter containers on the host. The docker.sock volume mapping can be safely removed when the agent is being used for monitoring only. The agent must be upgraded manually when the docker.sock volume mapping is not present. Containers Table: displays the containers currently running on this machine. When selecting a container, container logs are displayed. Those information are mostly provided for debugging purpose. Backend servers are usually protected behind firewalls to protect them from outer attacks. The agent doesn't require any port opening on firewall: it performs only outgoing HTTP requests to OctoPerf. OctoPerf Enterprise Edition: it depends if a Firewall is placed between your OctoPerf server and your agents. If a direct internet access is not an option, note that it is possible to direct all traffic from docker through a proxy. The procedure is detailed in docker documentation. The computer running OctoPerf agent must have a direct access to the application under test. Make sure the proxy is only required to access internet, not the application. -e NO_PROXY='': a list of hosts that should be reached directly, bypassing the proxy. If your proxy is SSL-Secured, use https instead of http. For a more complete documentation, see Configuring Proxies documentation. Copy the containerId and run the command docker stop containerId. The agent should be marked as DOWN within a few minutes. Agents down for a while (>= 1 Hour) are automatically removed. Restarting a removed agent will make it reappear on the server again in UP state. My agent does not appear in the agents list. 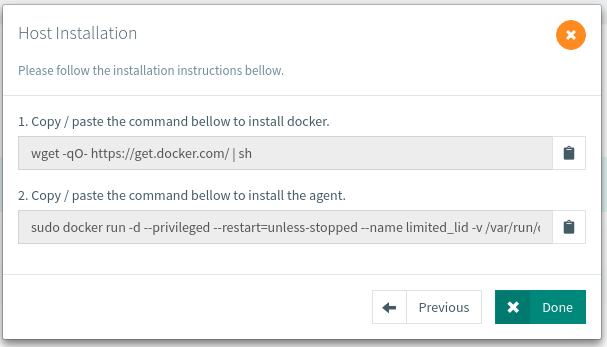 Make sure you have successfully installed Docker and launched the agent on the machine. You can inspect the Docker container logs by using the command docker logs -f <container id>. Feel free to contact us if you still experience some issues. The vagrant up command hangs on Windows 7. This is a known vagrant issue: https://github.com/hashicorp/vagrant/issues/8783. You simply need to download and install the latest PowerShell on windows 7. Then proceed to re-install it. Connect via a linux terminal on the host machine and inspect the containers using the command docker ps -a | grep docker-agent. Find the monitoring-agent container and copy its id. 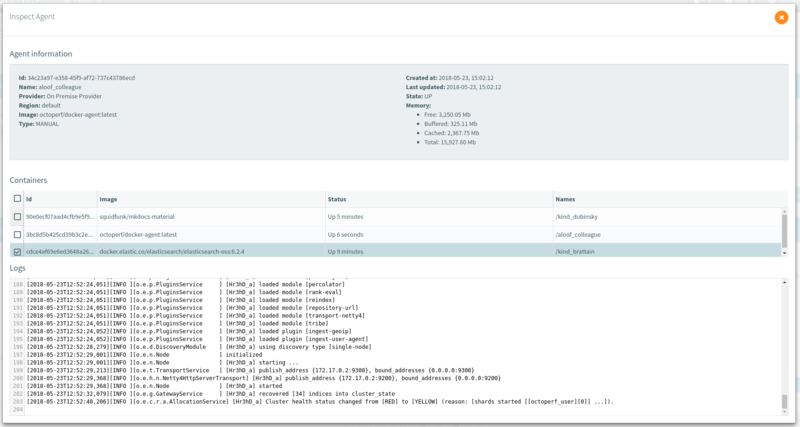 Then run docker logs <containerId> where is the id of the container. The agent logs should show you if it's a connectivity issue (no internet connection?) or something else. Contact our support team in case you are unable to find out.